So, I learned something the other day. More to the point, I learned that some people needed to learn a particular something. It has to do with a typical typing keyboard. I found out the other day that some people didn’t know that. Or at least, I think I found that out. Anyway. I thought it was interesting. This entry was posted in Webmaster and tagged webmaster on November 30, 2016 by Webmaster. So, a friend shared a fun link. It’s about a life-sized gummy chicken. I hope he does something like this with a Turkey next year. It’s quite impressive. Just THINK about how much sugar is involved! Anyway. Have a lovely Tuesday! This entry was posted in Webmaster and tagged webmaster on November 29, 2016 by Webmaster. Last Friday, as some of you are probably aware, was “Black Friday” in the United States. A number of companies provided fairly sizeable discounts, or interesting opportunities. Others provided satire. For example, there was the opportunity to essentially throw one’s money down a hole. That is, a particular company provided the opportunity for people to support digging a hole. The hole became larger as donations increased. There was no purpose for the hole. I found it rather amusing, and also a bit depressing that people would, actually, throw money down a hole like this. I hope your Monday is not as wasteful. This entry was posted in fluffy, real world and tagged Fluffy, real world on November 28, 2016 by Fluffy McGiggles. I recently became aware of the fact that your world has an island named “Disappointment Island.” I do not know what the poor landmass did to deserve such a name, but I thought it rather… amusing. I hope you have a non-disappointment-filled Sunday. This entry was posted in fluffy, real world and tagged Fluffy, real world on November 27, 2016 by Fluffy McGiggles. This entry was posted in Christmas, fluffy, Holidays, music and tagged Christmas, Fluffy, holidays, music on November 26, 2016 by Fluffy McGiggles. Happy Black Friday — Let the Christmas Music Commence! So, as you know, yesterday was Thanksgiving. That makes today “Black Friday.” More importantly, though, it’s now ok (from my and others’ perspective) to start playing Christmas music in America. I know that those outside the US get to start early since they don’t have the same late-November holiday. But here, it’s more appropriate to wait until after Thanksgiving before putting up Christmas decorations, or singing (or playing) Christmas music. A lot of stores ignore this, but oh well. Anyway. So, that means that now that Thanksgiving is over, it’s fine to play Christmas music! So, I’m reminding everyone that this epic piece of epicness exists. This entry was posted in Christmas, music, Webmaster and tagged Christmas, music, webmaster on November 25, 2016 by Webmaster. Thanksgiving and 1000th Webmaster Post! So… Long time no see. Ish. Or something. You see, this is the Thousandth Post where I, The Webmaster, am the listed author. So yeah, some of them may essentially be posts from The Student on the cooking website, and I may have contributed significant amounts to some of the posts where Fluffy McGiggles is the listed author, but this is still the 1000th affiliated with “Webmaster” as the author. So, that’s exciting! And it feels like it should be a big deal. And in honor of that, and in honor of Thanksgiving, the American holiday devoted to giving thanks, I just wanted to give a big shout-out to all of you. Thanks for reading. Thanks for sharing. And thanks for enjoying! I hope you have a great Thanksgiving. And here are some old posts that are coming to mind. First, a relatively seasonally appropriate one from last year, pertaining to California and Fall. I’m not sure why, but I just really like that one. Second, one that’s been getting a lot of new readers. (Even if they don’t really stick around…) It’s the one about “The Fox Box”. Third, because the Fox Box reminded me of it… the various posts about The Fox Song. (That’s an example of one I basically wrote, but that didn’t get characterized as “The Webmaster Wrote This.” Oh well.) Also, my later analysis of The Fox Song. I’m thankful that some existed. It meant I had the opportunity to write about it. Fourth, I’m rather pleased that I discovered the Kitten Takeover. After all, who knows? If it’s a part of the rainbows’ plan, this might help! Anyway. What are some of your favorites? What are some things you’re thankful for? I’d encourage you to take some time today, and reflect! This entry was posted in 1000th, big deal, Holidays, Webmaster and tagged 1000th, Big Deal, holiday, webmaster on November 24, 2016 by Webmaster. I was examining traditions pertaining to the American Thanksgiving (which is tomorrow), and was reminded of a peculiar tradition. Apparently, every year the president “pardons” an official Thanksgiving turkey. The White House has more information about this tradition. It is quite interesting! Have a lovely Thanksgiving Eve. This entry was posted in fluffy, Holidays and tagged Fluffy, holidays on November 23, 2016 by Fluffy McGiggles. I am continuing the emphasis on Thanksgiving and turkeys. After all, Thanksgiving in the Untied States is on Thursday. Today’s is more a commentary on something being sold. I cannot quite decide if it is intentionally seasonal or not. 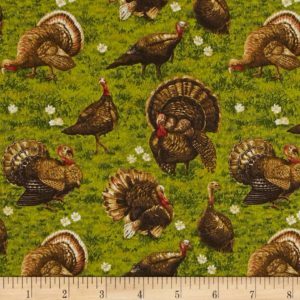 It is, and I quote, “Golden Harvest Metallic Turkeys” fabric. I believe that part of what is confusing me with this is the metallic nature of this fabric. I am not entirely sure how it is metallic. I am also not entirely sure how on earth it would be used. It seems as though it would make a rather gauche tablecloth, for instance. However, it does fit the theme. This entry was posted in fluffy and tagged Fluffy on November 22, 2016 by Fluffy McGiggles. As you are aware, Thanksgiving is fast approaching the United States. Roast turkey, as mentioned yesterday, is common. I will be intrigued to find out if inconvenient wild turkeys are ever used; it seems like it would be a logical source. Regardless, stay safe from wild turkeys. This entry was posted in fluffy and tagged Fluffy on November 21, 2016 by Fluffy McGiggles.